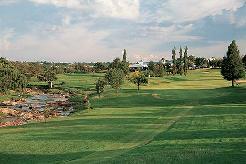 The Lost City Golf Course at Sun City has golfers astounded by the breathtaking beauty of this par-72 layout. 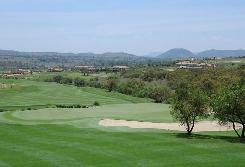 The rich green fairways give a dramatic contrast to the bushveld backdrop and the barren waste bunkers are a special feature of this intriguing course. The desert style design of the golf course has an exotic allure all of its own and designer, Gary Player has acknowledged it as one of his favourite courses. (See our News and Views section for course closure dates). The most hazardous area of the Lost City Golf Course is the 13th hole. Inhabiting the water hazard are 38 crocodiles, some of them nearly two metres long. Golfers are discouraged from retrieving their wayward balls from the croc infested pool. This unusual water hazard is just one of the features that make the Lost City Golf Course exciting and interesting to play. No effort was spared to make the course a masterpiece. Playing the back nine is like going on a golf safari. It has often been noted that the game is more exciting when played downhill and this is certainly the case here. In addition to the previously mentioned 13th, holes eleven, fourteen, fifteen and sixteen are all played from elevated tees offering thrill, excitement and challenge to the golfer - And some of the most spectacular African views to be had on a golf course. On the whole a round at Lost City is an experience which one will not easily forget. But it doesn't end with the golf. 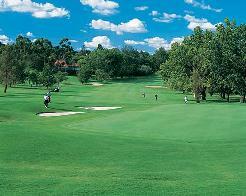 (Golf Carts are compulsory at Lost City course).